Lower jaws of adult cow and calf. Those who walk the beaches of LBI occasionally come across a peculiar find – a bone sticking out of the wet sand where the last wave broke. The first thought is often morbid; perhaps a lost swimmer or sailor who was swept away by the deep. Or perhaps something even darker. Given the shipping history of Long Beach Island, the most likely owner of that bone was a cow. Over the years, large numbers of cow bones have been found on the beaches of LBI and with them a growing curiosity has risen as to their origin. Cow bones that wash up on LBI are roughly 80 to 150 years old. Beachcombers wonder if their find is a rare fossil, human remains, or remnant of a sea monster. Many tales have been told of the origin of these strange artifacts. Here, finally is the true history of the cattle bones of LBI. As early as the 17th and 18th centuries early European settlers introduced cattle to Long Beach Island. At that time, the island was believed to be inhospitable for people due to the marshes and cedar swamps. Settlers utilized the barrier island as pasture for cattle. As winter became spring, mainland farmers ferried their herds to the island. The cattle were left to forage during the spring and summer months, returning to the mainland as the leaves began to change. By the late 19th century the dairy cow population on the island grew. Cows were transported on and off the island by ferry to avoid overgrazing. However, dairy farms were not the main source of bones found on LBI shores. In the late 1800s through the 1930s, large ships carried the bones of butchered livestock from slaughterhouses across the Atlantic Ocean to the United States. Originating from Italy and Spain, bone ships sailed along the coast of Long Beach Island. Destined for New York harbors, the unusual cargo would be unloaded and later ground down into bone meal for fertilizer. When calcined – heated to remove moisture – the bones and teeth became calcium phosphate, the main source of phosphate in fertilizers. Frequently ships were filled to the point of being bottom heavy, causing them to run aground on the infamous shoals of LBI. One such ship was the Spanish schooner Remedios Pascaul, built in 1885. On January 3, 1903, the Remedios Pascaul ran aground 200 yards off the coast of Ship Bottom during a storm. According to records, the twenty-one person crew survived. However, the ship and cargo were lost. Nicknamed “The Bone Wreck” by divers, thousands of cow bones remain scattered across the seafloor. About twenty years ago, dredging off the coast of Ship Bottom and Barnegat Light brought large quantities of bones into shallow waters and onto the beaches. Although cow bones were the most common livestock bones cargo, the ships hulls also contained the slaughterhouse bones of horses, sheep and pigs. It is a common misconception that the cows were still alive while on the ships. While there were large ships that carried live cattle across the sea to the United States to be slaughtered, their sinking was rarely the source of the bones found on LBI. The most commonly found cow bones on LBI are leg bones, molars, mandibles or lower jaws, ribs, and vertebrae. Many have mistaken the cow lower jaw for the lower jaw of a horse. Cow jaws are more curved while horse jaws are wider and more angled. 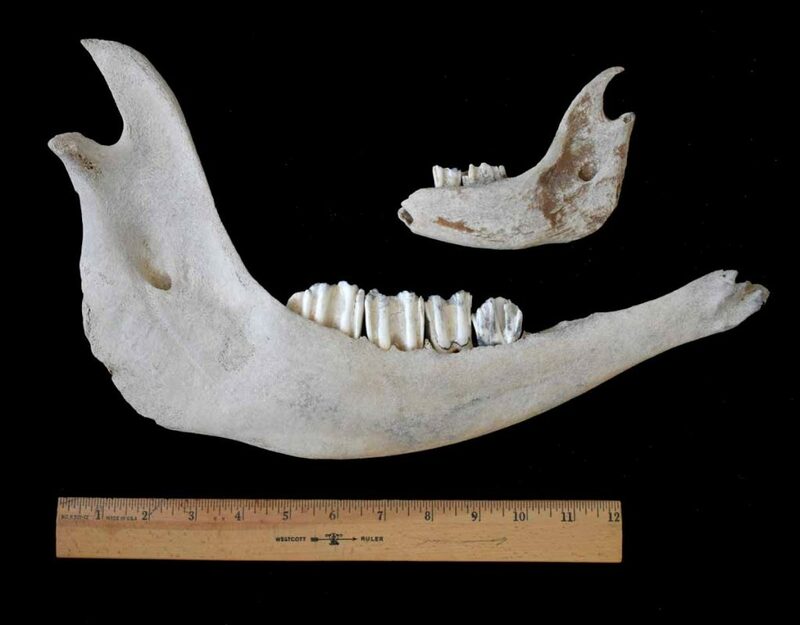 Cow molars can be quite large and somewhat flat with vertical plate like ridges for grinding grass. They are shorter than horse teeth. A simple way to tell if the bone you found is from a slaughterhouse is the presence of cut marks from butchering. The leg bones of a cow can be quite long and at the thickest part near the joint, it can be nearly seven inches wide. Leg bones are the most likely to exhibit the straight, sawed ends of butchering, as bones were reduced in size for shipping. Beachcombers have mixed views on these bones. To some, the antique bones are a welcomed wrack line oddity to be added to their shell display. Others find the livestock bones off-putting. Some mistakenly believe the bones would have foul odor. Odors from decomposing flesh are a result of gasses emitted by bacteria. A century at sea has scoured away any vestige of animal tissue from the bones. Clean, dried bones should not smell. However, not all beach found bones have been a drift for decades. Bones from an animal or fish that has died more recently may have an odor. If that is the case, soak your find overnight in a mixture of water and Dawn dish soap. Never use bleach, cleaning products, chemicals, or even household vinegar as they damage bone. Bones should be cared for like fossils and historical artifacts. Proper preservation and storage of bone artifacts are important. Check your finds for green mold. Green mold destroys bone and is impossible remove once is penetrates the marrow. Bones with green mold should be left to nature. A gentle rinse in cool water is generally sufficient to clean way any sand or mud. Bones must be allowed to air dry. 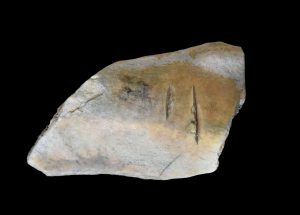 Depending on the thickness of the bone – drying can take several days. Once thoroughly dry, proper storage is very important. Bones should never be kept outdoors, exposed to direct sunlight, CFL bulbs, or temperature fluctuations. Doing so will cause deterioration and permanent damage. Bones should be stored indoors in a dry location. It is best to place them in a box or jar or display shelf away from windows and heater vents. Whether you are an occasional bone collector, a bone collecting enthusiast, or prefer to pass them by – beach found bones are a unique part of the history of LBI.